Summarize the benefits of adding Inbox features to your Gmail™ integration. Enable Inbox features for your sales reps.
Ursa Major made the move to the cloud-based Gmail integration, and Maria, their heroic admin, set up Lightning Sync. She’s already noticed that her sales reps get more done in less time. And now that the reps are up and running with the Gmail integration, she’s ready to take their productivity to the next level with Inbox. Let’s review the awesome features that reps can use in their email when you add Inbox to the Gmail integration. Schedule meetings with customers and prospects, often going back and forth trying to find the right time. Insert open time slots from their calendar directly in an email message. Recipients select which time works best for them, and the integration schedules the meeting. The suggested times dynamically update as a rep’s availability changes, even after the customer receives the email. Wonder whether the email they sent was ever opened, or whether it’s too soon to follow up. See when customers open an email and whether they clicked any included links. Reps know with certainty when their customers engaged with what they sent. Type the same phrases again and again when promoting your company’s products and services. Create shortcuts for the phrases they use most and easily add them to email messages. Reps say goodbye to potentially embarrassing typos and hello to saving time! Engage with customers and prospects at the best time. Draft an email message and send it when the customer is most likely online. Because timing is everything, reps can schedule when their customers receive the email, guaranteeing the greatest impact for a potential sale. Those features can increase the efficiency of Ursa Major’s reps when they communicate with customers and prospects. Let’s talk about how Maria takes advantage of these features. With the addition of an Inbox license, reps experience all the benefits of Inbox features. Maria talks to her Salesforce sales rep about activating the license. Next, it’s time to turn on Inbox in the Gmail integration and select which users get access to the features. Enter Gmail in the Quick Find box, and then select Gmail Integration and Sync. 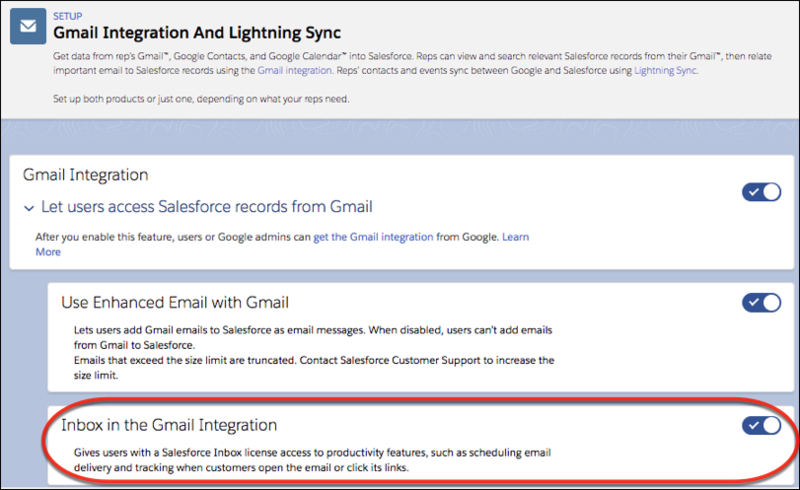 To see the Gmail integration settings, expand Let users access Salesforce records from Gmail. Turn on Inbox in the Gmail Integration. That was easy! Maria’s ready to select who gets access to Inbox features. In the Gmail Integration and Lightning Sync setup page, click Manage Permission Sets. Select an Inbox standard permissions set, Inbox With Einstein Activity Capture or Inbox Without Einstein Activity Capture. The Inbox With Einstein Activity Capture permissions set gives reps access to Einstein Activity Capture and the Activities dashboard. Learn more about the benefits of Einstein Activity Capture in the Resources section. Click Manage Assignments, and then select the users who get access to Inbox features. When Maria turns on Inbox in the Gmail integration, the standard Gmail integration pane includes all Inbox features. Maria still has flexibility to customize how Salesforce content appears in Gmail, and which Inbox features her reps can access. Because Maria customized the email pane for her reps, they don’t yet see any Inbox features. Maria can either reassign her reps to the standard email pane with Inbox features, or add the features to the customized pane using Lightning App Builder. Either way, reps see the changes the next time they access the integration in Gmail. Customize multiple panes that include specific features for different sets of sales reps. For example, if some reps don’t track emails, build a pane that includes all Inbox features, except the one that tracks email. Integrating Gmail with Salesforce is a great way to keep your reps productive with the tools they rely on most. You reduce context switching, so your reps can focus on the important things: Their customers and closing deals. And Lightning Sync keeps your reps’ contacts and events in sync, so your reps don’t miss a beat. Add Inbox features to the integration, and your reps get all the tools to work at top speed. 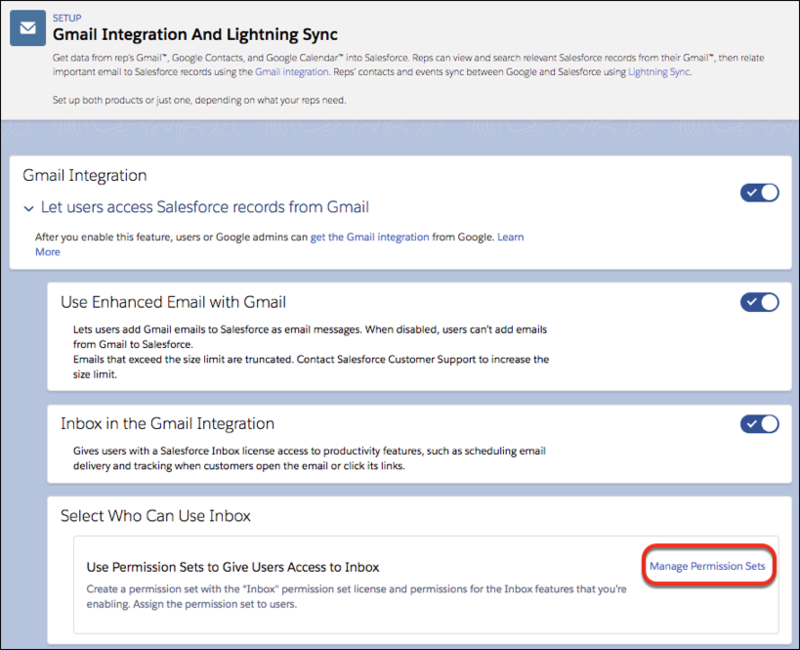 Use these resources to learn more about setting up the Gmail Integration and Lightning Sync.